I have the best intentions before I walk into a fabric store. “Get what you need, Jennifer. Just get what you NEED.” But my best intentions quickly disappear once I see clearance signs or 80% to 90% off signs. How in the world can I pass up pretty green dot fabric when it’s on clearance for $2 a yard? The answer: I can’t. I have a weakness for dots, cuteness, and clearance. 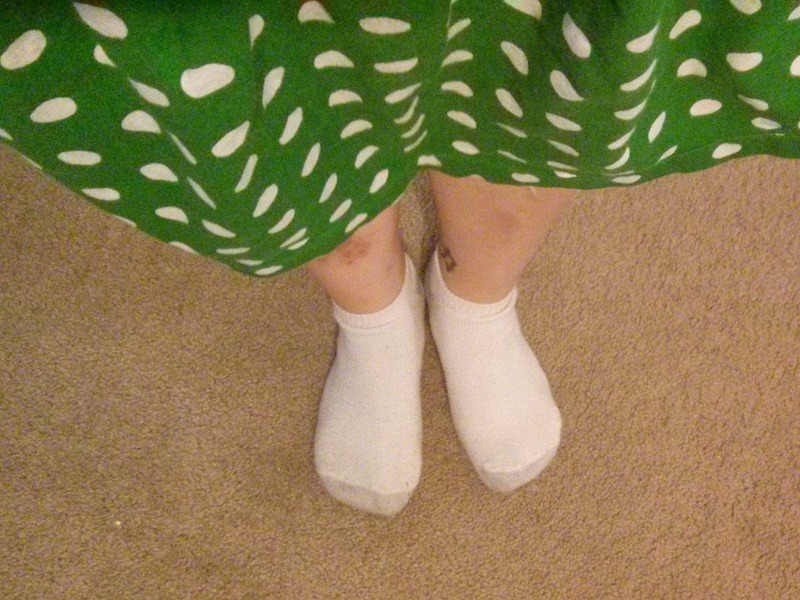 For less than $3 (I can’t remember the exact price), I picked up a yard of super cute green dot fabric that I knew would look super cute as a flouncy little skirt. After a few hours during one evening, I had a really cute green dot skirt that really needed to be ironed (not my favorite task to do). Other than a white shirt, what other color would match this skirt? During a new pillowcase project (another post for another day), I accidentally flubbed two pillowcases. I don’t think I’m a perfectionist, but I didn’t want to use the flubbed cases and be reminded of my glaring mistake. My lovely head needs to rest on a nice pillowcase. Instead of fixing the two pillowcases, I decided to turn them into a skirt! With two flubbed pillowcases in my hands and less than an hour later, I had a nice pencil skirt. Surprisingly, I thought the pillowcase fabric looked super nice as a skirt. Not super surprising, Charlie chuckled at the pillowcase skirt and could not promise to not point out my pretty pencil skirt matched our current pillowcases. Hmmmmmmm. I have the same problem when I walk into a bar — I think just one drink, maybe two. Then I end up having too many. Our problems are the same. Winky face. So very true!!! I am happy when I walk out of the store so many great deals!